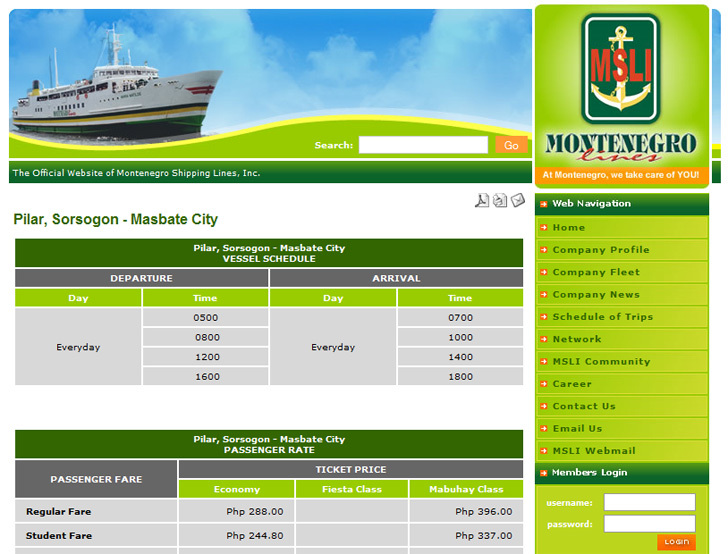 Travel by Sea on Montenegro Shipping Lines from Pilar Sorsogon to Masbate Philippines. There are multiple fastcraft from Pilar Sorosogon, located in Southern Luzon to Masbate Port in Masbate City. There is also RORO Vessels that take longer but allow vehicles, cargo, and buses to travel from Southern Luzon to Masbate. Montenegro Lines offers all in all 8 trips per day back and forth by Fast Craft Masbate - Pilar. There are two types of Montenegro Lines. The small ferry ship or what they call "Roro" and a fast craft. Roro is bigger than fast craft but slower than fast craft, which takes 3 hours while the fast craft takes just 2 hours trip. Roro is divided into two lay - the open air costing P200 and the wide, closed room with AC and TV cost P236. It is a bit longer to take a bus to Philippine Sorsogon and then by Fast Craft/Roro but more economical. Baggage must be up to 10 kilos but sometimes they consider the excess baggage depending the number of passengers.